When Google’s search engine became the defacto way to find products and services online, it made sense that companies large and small shifted their marketing dollars away from print advertising and into search engine optimization (SEO). Compared to print ads, SEO seemed to offer so many benefits, not the least of which you could reach far more buyers with a lot less money. Maybe you paid an SEO firm to help optimize your website, but you didn’t have to pay (or continue to pay) to get listed in Google’s organic (or non-paid) search results. But . . . recent changes by Google have made SEO much more difficult. In fact, Google has made so many changes, I now tell clients that if they’re relying on SEO to generate the bulk of inquiries, they may want to reconsider their strategy. In February 2016, Google moved all its AdWord text ads to the top of the search engine results page (SERP). This means that instead of two ads at the top of the page and two or more on the right side, you now have up to four ads at the top. But it doesn’t stop there. Google will sometimes insert a map pack right after the ads, which means the first organic (or “free”) listing is pushed even further down -- and we’re talking way down, as you can see in this image. As expected, organic click-through rates (CTR) have dropped. In other words, whether you rely on SEO or pay-per-click (or a combination of both), clicks are costing more money. In addition to moving the text ads to the top of the SERP, Google has been making all kinds of other changes, such as expanding the white space between the ads. It’s also changed the standard text ad from a 25 character count headline and two lines of descriptive copy to expanded ads that include two headlines. On desktop, these two headlines become one long headline; on mobile, they wrap to become two headlines. Then add in site links, video, or other text ad extensions -- and it’s pretty clear that organic is taking yet another hit in terms of lower clicks and being moved further down on the page. Speaking of mobile, Google houses its vast search engine data in multiple indexes, with mobile and desktop being the two primary ones. When you search for information using your smartphone, Google presents you with search results using its mobile index. Ditto for desktop searches. Desktop search continues to drive the bulk of organic traffic for small industrial manufacturers. Mobile use is growing, but it represents only a fraction of traffic. For the rest of the online marketplace, however, mobile is huge -- and Google has responded accordingly. In mid-October, the company announced its mobile index will become the primary index. Google has indicated this change will impact those businesses with mobile-versions of their website. Again, this is another change that will impact SEO efforts – especially if your website is old, clunky, and not suited to the new mobile landscape. Print ads and SEO do have one thing in common: you can target a specific audience. With print ads, you can target specific industries and audiences based on the publication and its demographics. With SEO, you can optimize your website or web pages using keywords that your target audience uses to find the products and services you offer. Except, not any more. In June, Google made a huge change to its Keyword Planning Tool, namely, it removed search volume data -- the very data many SEOers use to help optimize a website. Google is recommending you use its forecasting tool instead. What this change means is that it’s become much harder to know with precision which keywords to use when optimizing a website or web page. And, even with Search Console search query data, many small industrial manufacturers still don’t have a clue due to Google’s “Not Provided” or “Not Set” -- meaning, Google doesn’t pass search query information when a user is logged in and doing a search. Oy! While SEO has been a boon for many manufacturers, especially smaller companies, it also comes with serious cost concerns and challenges. One, you have no idea when or how the game will change. What worked yesterday can now cause a serious penalty or outright ban from the Google search engine today. And, because the search engine is constantly changing -- both in terms of its format and algorithm plus new content constantly being added to its indexes -- you can work for months to improve your “ranking” but see little in the way of results. Despite the toll print ads have taken because of search, they’re still a worthwhile investment for small industrial manufacturers. 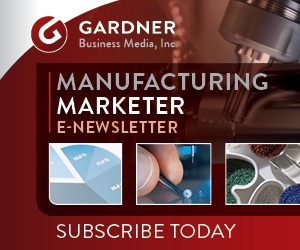 According to research by Gardner Business Media, manufacturers and engineers turn to trade publications to find information -- with 86% ranking print publications their number one and number two choice in terms of effectiveness. While pursuing case studies, application notes, and other timely information, readers also see ads; since these ads could be from companies that they don’t know about or haven’t done business with, print ads help build brand awareness. But print ads play another important role as well. According to Gardner’s survey data, 93% of buyers will click on companies whose name they recognize in the search results -- names searchers have seen as they read print publications. With SEO, searchers have to know your brand or product / service exists. With print ads, your message is right there in front of them. Once you sign a contract to run an ad multiple times during the year, you won’t have to worry about prices going up (even if the publication changes its format) or running afoul of any “rules” and getting penalized. You also have some control over the placement of your ad. You can purchase high profile positions, such as the inside back cover, or any size ad that suits your budget. You can’t do that with SEO. With all the changes Google is making, relying on SEO as your prime lead generation tactic can become a scary proposition. To ensure you build brand awareness and inquiries across multiple channels, it pays to have a diverse marketing mix, one that includes print ads. DIANNA HUFF is a marketing consultant who works with small, family-owned industrial manufacturers and job shops to help them market, grow, and succeed. She focuses her expertise on delivering fresh insights and strategies scaled to smaller manufacturers and their unique challenges. An award-winning marketer, Dianna has been quoted or featured in the trade media, including Forbes, BtoB magazine, and Search Engine Land as well as industry blogs and marketing books. She is a proud supporter of and advocate for the growing Made in America movement.